If you have high blood pressure, it is usually best to avoid canned soup or soup bought at restaurants. They contain lots of sodium, and if they are creamy they'll have extra saturated fat. 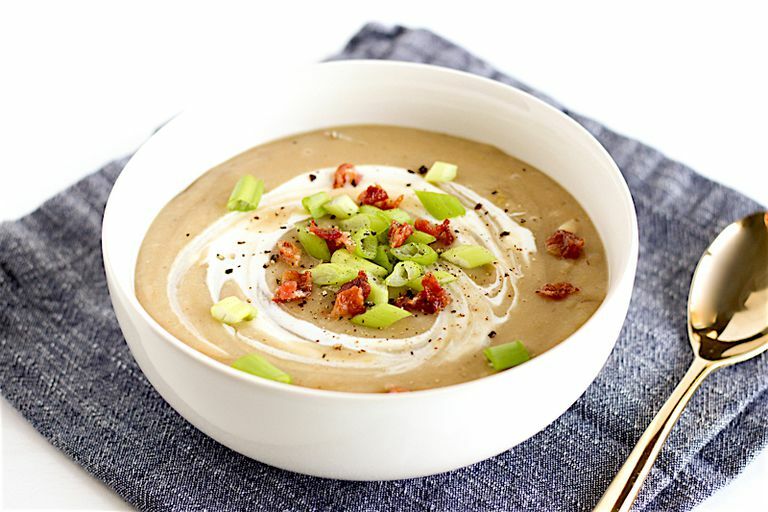 Potato soup, in particular, is commonly made with heavy cream, bacon, cheese, and sour cream, but just because you are trying to eat healthier doesn’t mean you have to miss out on it. This potato, leek, and white bean soup is loaded with flavor thanks to sauteed leeks and potatoes cooked in low sodium chicken or vegetable broth. Then white beans are blended in, resulting in a smooth, creamy texture with tons of flavor and nutrition. Heat oil over low heat in the bottom of a heavy-bottomed pot. Chop leeks and save greens for another use. Add the white part of leeks and garlic to the stock pot and cook, stirring, until softened. Add potatoes and broth and simmer, covered, until potatoes are soft, about 20 minutes. Remove from heat and transfer all contents to a blender. Add white beans and pepper and blend until smooth. Pour into bowl and garnish each with a dollop of yogurt, a teaspoon of chives, and a teaspoon of crumbled bacon (optional). This healthier version of potato soup provides plenty of fiber and plant-based protein and can be made vegan by using vegetable broth. If you aren’t vegetarian, feel free to top your soup with a dollop of plain greek yogurt, a tiny bit of crumbled bacon, and chives for even more flavor. For dairy-free, leave off yogurt. If you like your soup more chunky, leave half of the beans and half of the potatoes when blending, and stir them back in at the end. This soup makes a delicious and filling lunch along with a side salad or on its own. The recipe makes a big batch, so you can portion it out to eat all week long.